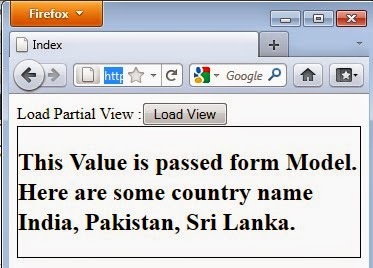 This article will show you how you can pass model value to partial view on button click in you asp.net mvc application. This article you can use in your MVC3, MVC4, and MVC5 application. 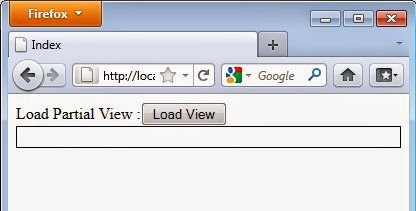 So for this article first we will create a new asp.net mvc application and add a model class file. Now we will create a new controller file and add create view file. After creating view file we will create partial view. 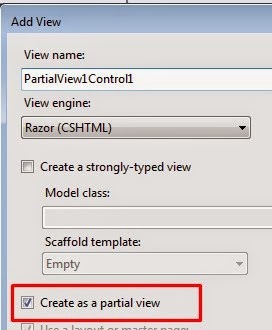 For creating partial view we will add we will right click on controller folder and right click- > Add View. Please check the below screen shot. Now we will create post method. After doing all the process your code will look as shown below. Now open your partial view and add the below code. Now add the below code in your main view where your want to display the partialview on button click. Now run the application, and select the parameter and click on Load view. Now click on button your partial view will load. Hi What issue your are facing? how to display data from database using partial view?